So far this season one of the most surprising narratives has been the strong start made in the Premier League by Watford. Under their new Portuguese coach Marco Silva they had started the season unbeaten with wins against Southampton and Bournemouth and draws against Liverpool and Brighton. The results were impressive enough but these were coupled with the side playing some excellent football in the formative weeks of the season. That said a tie, albeit at home, to Manchester City would prove to be an altogether sterner test for Watford this past weekend. Manchester City seem to have hit their stride early this season and they came in to this match over a 5-0 league win over Liverpool and a 4-0 win away in the Champions League over Feyenoord. The nine goals scored with none conceded were impressive enough but the manner of the performances in which City seemed to meet the tactical blueprint set out by Pep Guardiola was even more impressive. The best chance for Watford in this match appeared to be their greater preparation time. Whilst City were engaged in European action in the midweek Watford would have extra time to prepare for the visitors of Guardiola and his playing staff, City on the other hand would be expecting to impose themselves on this match rather than planning for the threats of Watford. Watford began the match in something approaching a 4-3-3 system, in an effort to congest and overload the central areas where City are traditionally exceptionally dangerous. Gomes started in goal behind a back four of Daryl Janmaat, Adrian Mariappa, Christian Kabaselse and Jose Holebas. The impressive Abdoulaye Doucoure played in the centre of midfield along with Tom Cleverley and Nathaniel Chalobah, Richarilson and Andre Carillo were wide and Andre Grey started as the lone forward. Formation and shape are at times all but impossible to decipher for Manchester City under Guardiola, especially in the attacking phase where they are especially fluid in their positioning and movement although they appeared to start this match in something approaching a 4-3-3 system. Ederson was fit to start the match despite being stretchered off injured during the match against Liverpool the weekend before. Two of the fullbacks bought for significant money in the summer started in Kyle Walker and Benjamin Mendy whilst Nicolas Otamendi and John Stones played in the centre of the defence. In midfield Fernandinho was the screening midfielder whilst both David Silva and Kevin De Bruyne played central roles, although both were given freedom to play across the width of the field. In attack City have at times paired both Sergio Aguero and Gabriel Jesus centrally but in this match the young Brazilian would start on the left with Aguero as the lone striker, Raheem Sterling would then play on the right. Last season, their first under Pep Guardiola, Manchester City started in such a way that they appeared to be unstoppable both domestically and in Europe. The key in these opening weeks were the performances in the centre of the park of Kevin De Brunye and David Silva. Both players started nominally as central midfielders playing as number 8’s (more attack minded midfielders) in terms of their movement and positioning throughout the matches however both operated more as pure number 10’s in the attacking phase, constantly looking to find space in between the opposition lines and play forwards. This season has seen City again start in fine form and once again the performances of the two central midfielders are one of the keys to these promising performances. This is early in the match and already Silva and De Bruyne are setting the tone for the game. City are in the second phase of their attacking movement having regained a hasty Watford clearance and as De Bruyne picks up possession of the ball in the left half space I have highlighted Silva who is already in space on the same side. Despite there being five Watford defensive players in close proximity to him Silva has already maximised the space that is available for him to play in. The movement from this point is simple, the ball is played in to Silva who then lays it back in to the stride of De Bruyne past the covering defensive player and the Belgian international is able to have a shot at goal. This time it is Kevin De Bruyne who is operating in a pocket of space and once again despite there being four defensive players close to him he is perfectly positioned. As John Stones steps out with the ball in to the middle third of the field he has the time and space to thread the ball in to the feet of De Bruyne. When the Belgian international takes possession of the ball he is then able to turn and play from an advanced platform in the final third of the pitch. Note that there is another City player in space on the same line as De Bruyne and who can offer the option for a quick pass centrally. The movement of Silva and De Bruyne throughout the match was key to unlocking the defensive structure of Watford. As the home side started to lose their grip on the match the ability of the two City midfielders to play in and around the final third in space offered a constant option for City going forward and allowed them to effectively pin Watford back. As important as De Bruyne and Silva were in this match for Manchester City it was equally important that City were able to progress the ball from the back, this was where central defender John Stones came in to his own. Last season was a difficult one for the young English international defender as he struggled to come to terms with the tactical expectations that Pep Guardiola has of his central defenders. This season however he seems like a far more confident and assured player who has grown in to the role assigned to him by the Spanish coach. 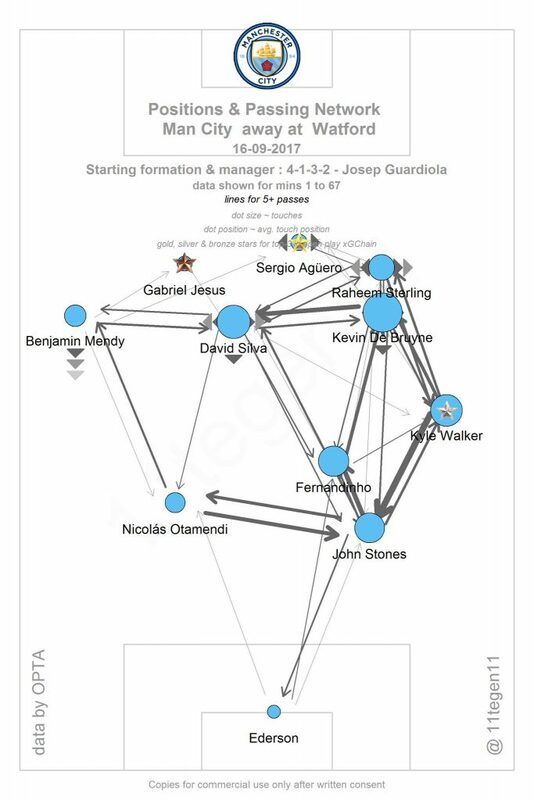 This pass map was created by @11tegen11 using opta data and it shows the importance of John Stones in moving the ball forward for City. There is a clear bias in the data for City to build up from the right hand side with John Stones being central to that bias. Here we seen an example of Stones in possession when he is given time to pick a pass through the defensive lines of the opposition. Watford were sitting in a medium block with passive pressing but they were looking to close off the first pass in to the midfield. The key here was in an interesting piece of movement from Fernandinho, the Brazilian midfielder is closely marked and his movement out from the central area in to the right back slot drags his marker out and opens up the passing lane for Stones, the English central defender then has enough time to pick an easy pass in to the final third. In the second half as City were in complete control we saw Bernardo Silva replace De Bruyne with the Portuguese international playing out on the right side and Raheem Sterling coming in to the central area. That however did not change the build up process from City and here we see Stones in possession of the ball under passive pressure once again. Sterling has taken up an advantageous position centrally and the pass from Stones takes four Watford players out of the game and leaves Sterling able to turn and attack the central area of the field as he moves in to space. The Spanish international midfielder has been key to City’s attacking gameplan for years now and he shows little sign of slowing down or of his performance dropping off. There were however signs in the second half of this match in particular that could foreshadow a slight change to his role within the tactical structure. With Kevin De Bruyne and then in the second half Raheem Sterling playing centrally with Silva there was a clear opportunity for the Spaniard to start affecting the play from deeper areas. We saw more and more that Silva was comfortable dropping in an dictating the flow of the game from the defensive or middle thirds of the field. Here as Watford looked to press and prevent City from playing out from the back it was David Silva who dropped in to the edge of his own penalty area to provide Ederson with a passing option. With three Watford players then taking out of play by a simple vertical pass it was easy for Silva to take possession in space and then turn the ball out to the wide area where John Stones had taken up a free position. Once again here we see David Silva as the link player who has dropped in to the defensive third for City to take possession of the ball and move the ball forward in to attacking positions. In these positions on the field Silva has the quality to play accurate passes in to more congested areas of the field to allow his side to then open out and play in to space. This example is a case in point with the ball initially played forward in to the central area despite there being four Watford players in close attendance. The ball can then be played out to the wide area. If the initial pass is straight out to the player in the wide area then Watford would be able shift their defensive structure over to cover, with the first pass being central the defensive players are effectively pinned centrally and the ball out to the wide area will find the City player with space and time to play. Despite the match ending 6-0 in City’s favour it would be unfair to say that Watford were exceptionally poor in this match, instead we have to say that City were exceptional with their passing and their movement in the final third especially. As you can see from the expected goals plot, provided once again by @11tegen11 using opta data. City were clear winners in terms of xG. Watford struggled to possess the ball for long enough to create any significant chances on the City goal. The away side on the other hand were constantly moving and playing the ball in tight spaces centrally. It remains to be seen whether City can maintain this run of form but if they do so then it will be exceptionally difficult for anyone to stop them this season.